This guide is only meant to help diagnose network problems on your Mac. This step can fix most Wi-Fi issues. To begin, open the Wi-Fi menu in the status bar. Click Turn Wi-Fi Off. Open the Wi-Fi menu again, and click Turn Wi-Fi On. 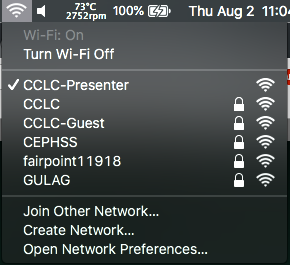 Your Mac should reconnect to the "CCLC" Wi-Fi network. If the step above doesn't resolve your issue, and you have a poor connection, try moving closer to an access point. Generally this means being inside a building, and not outside. If you have a poor connection inside a building after following the step above, please report it to IT staff. If your Mac is connecting to another CCLC network other than "CCLC", then use these steps to remove the other networks. Your Mac should only connect to "CCLC"
4. Find the network, click it, and click the minus (-) symbol. 5. Click OK, then click Apply. If your Mac doesn't connect to the "CCLC" network, please click the "How can we help?" button in the lower right of your screen to ask for the password. If you still need help connecting, you call the CCLC and ask for an IT staff member: 207-733-2233.